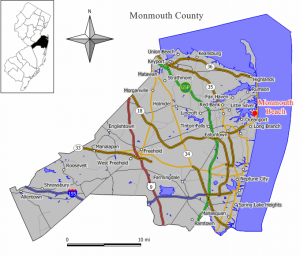 Search for Monmouth Beach condos or high rises for sale. Most of the Monmouth Beach Condos For Sale are in one of the Monmouth Beach high rises. In fact, there are three Monmouth Beach high rises. The Admiralty and The Shores are ocean front high rises. However, the Channel Club Tower is located on the Shrewsbury River. The Monmouth Beach High Rises have one, two or three bedroom homes. The Channel Club Tower is 14 stories high, The Shores is 12 stories high and The Admiralty has 14 stories. All of the Monmouth Beach High Rises offer 24 hour security and concierge services. One of the condo complexes to look at to find Monmouth Beach condos is Wharfside Manor where the condos are either one or two bedroom units. Some of these condos are waterfront while others offer a water view of the Shrewsbury River. The other condos Monmouth Beach are Monmouth Commons and Sands Point. Boating enthusiast appreciate Monmouth Beach because you can buy a condo, townhouse or high rise, and some of these homes have boat slips available. Students in grades kindergarten through eighth will attend Monmouth Beach School. When a student begins high school they will attend Shore Regional High School. Furthermore, students from Sea Bright, Oceanport and West Long Branch also attend.